Being from the Energy & Environment group at UHN, you could guess that I’m an environmentally minded person. I try to limit my environmental impact wherever possible, I also eat healthy(ish), select organic produce (especially for the ‘dirty dozen’), and avoid processed foods, I exercise, select green certified products, and limit my chemical use/exposure. I’m an engineer, a former green building consultant, and current energy manager, so I like to research and I’m fairly familiar with these issues. Many months ago I learned I was adding something to my resume, the title of “Father” :). Soon after the initial joy and excitement, my wife and I realized we needed to prepare. This is when I learned I had overlooked a very important environmental issue. 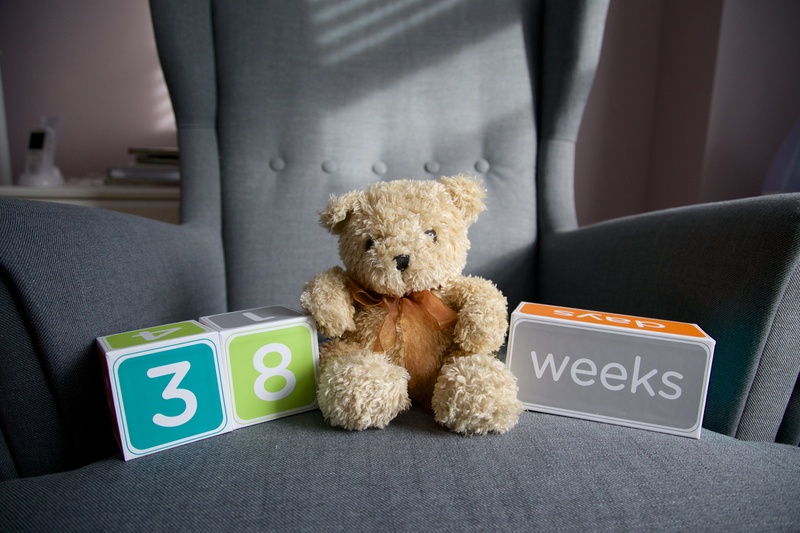 More specifically what is in these baby products and what types of materials will our baby be exposed to in the womb and during the early years of life. I had expected baby products would be held to a higher standard, that companies would take a more cautionary perspective when creating their products. Generally I’ve found that isn’t the case. There seem to be just as many toxic chemicals in baby products as in products made for full-grown humans. Only a small fraction of chemicals used today are tested and very few are restricted (9 banned in the US and >1000 in Europe). There are millions more chemicals out there than when we were kids. Literally millions. There were 212 thousand registered in 1965, there were 88.7 million registered as of 2006 (in CAS). We have also discovered many of these chemicals are toxic to human health. We live in this environment and we are affected by it, so managing what we are exposed to is important. There is an entire field of study of how external factors affect our genes and development called epigenetics. There are carcinogens, endocrine disruptors, neurodegeneratives, and respiratory irritants in many baby products. Endocrine disruptors are known to affect our genes and body processes, which is believed to be part of the rising rates of autoimmune disease. Cancer rates in children are also increasing, with cancer being directly linked to many chemical carcinogens like dioxins. The International Federation of Gynecology and Obstetrics (FIGO) recently published an article in the International Journal of Gynecology and Obstetrics, expressing their concerns over the reproduction health impacts of exposure to toxic environmental chemicals. The typical crib mattress is polyurethane foam wrapped in a waterproof PVC cover. PVC stands for Poly Vinyl Chloride, which normally is a rigid plastic (e.g. pipes). To soften it up plasticizers called phthalates are added to the plastic. Phthalates absorb easily into the skin and are endocrine disrupters (the endocrine system is a network of hormone producing glands that help control many important body functions). Bisphenol A (BPA) is also used to make PVC, the product everyone was trying to get out of their water bottles (and did so successfully!). PVC manufacturing, burning, or landfilling, also releases dioxins, which can cause reproductive, developmental, and other problems. The polyurethane foam is highly flammable so to make is safe for a baby’s bed they soak it with flame retardant chemicals. Halogenated, chlorinated, brominated, organophosphorus flame retardants should be avoided. For example PBDEs (brominated) are linked to infertility, low birth weight, lower IQs, attention problems, motor skill development, cancer, and early puberty in girls. Recent studies in animals linked these chemicals to genetic effects leading to social and language deficits. No developing human should be exposed to those chemicals and no parent should have complete a masters thesis to chose a mattress. Look for one that has food grade polyethylene waterproof surface with a cotton core (and no flame retardants). Polyethylene is one of the simplest and most stable plastic compounds, it’s doesn’t leach or break down (hence the food-grade). 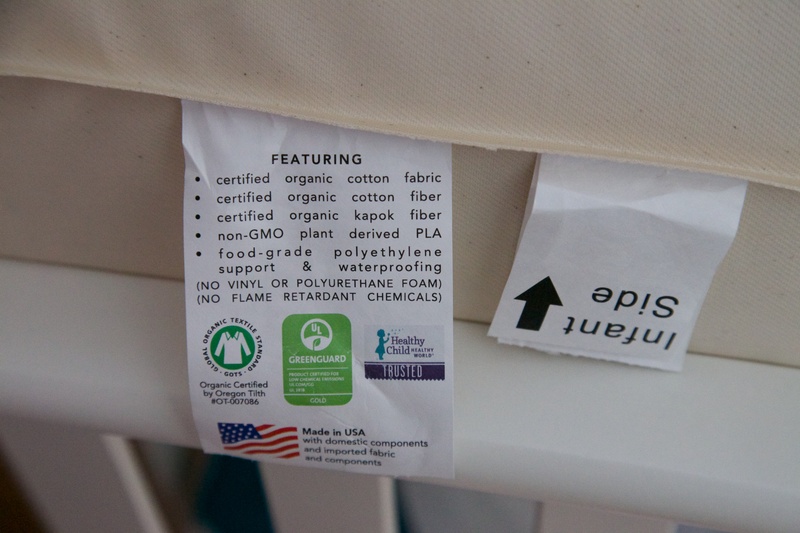 This is the tag from our Naturepedic mattress, which is also GreenGuard certified. Some baby sleepers have flame retardants. I don’t know why, this seems ridiculous. Some sleepers are classified as ‘blankets’, whereas baby pajamas apparently required to have flame retardants. I’ve gone the route of selecting ones with organic cotton or wool..
A nonprofit called the Ecology Center completes chemical testing of many products including car seats. There report can be found here. What I couldn’t believe was that some of the supposedly environmentally safe brands tested so poorly. 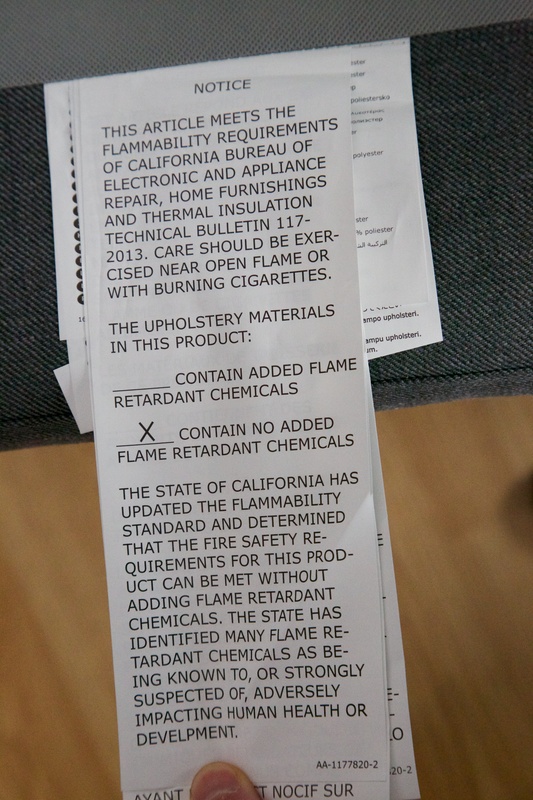 California has changed their flame retardant laws and many manufacturers are removing them from their products. Look for TB 117-2013 compliance. Ikea was compliant as of January 2015 for example. Flame retardants bioaccumulate and North Americans have the highest levels in the world due to ill conceived laws. Here’s a tag from the chair we bought for the baby’s room (we also converted the lounge chair into a rocker). We selected some used furniture that hopefully will have off gassed by now (a crib with non-toxic paint). Furniture made with solid wood is best, but if you can’t get that ensure the wood is NAUF (no added urea formaldehyde) or formaldehyde free. We also purchased an air filter to remove pollutants found in the room (dust is known to capture and hold these chemicals). 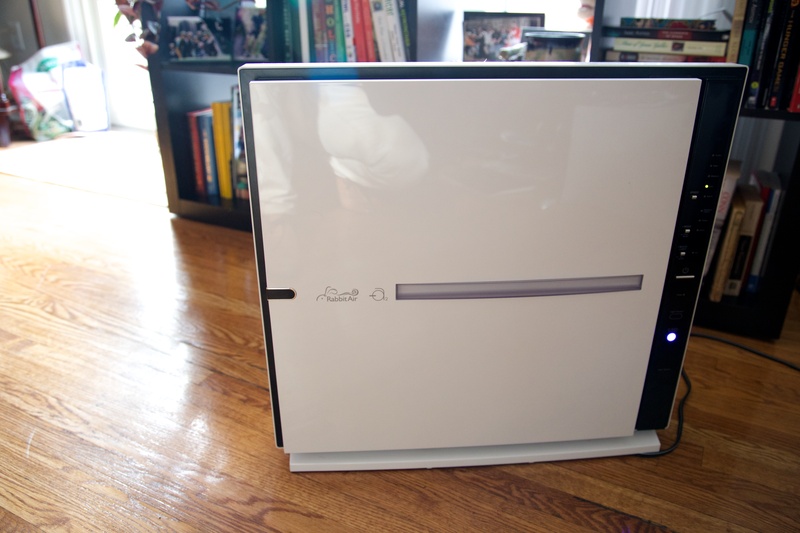 The air filter has a HEPA, VOC, and carbon filter in it. We’re still a way off from solid food, but we have a plan. There are specific baby food processor units that will steam, blend, sterilize, heat, and defrost. You can buy organic carrots and yams and whatever you like at the grocery store, to fill reusable containers the reusable containers for immediate eating or short term storage. We’re going to try reusable diapers, they’ve come a long way in recent years. We do also have some disposable ones for travel, the first couple days, and just-in-case emergencies. It doesn’t have to be all or nothing, it’s about reducing your impact. My approach has been to focus on the high impact items, limit the exposure times and the worst chemicals. This is an approach that everyone should take to ensure their own health. I hope you’ve found my experiences useful and at least somewhat informative. Take the precautionary principle and take control of your chemical exposure, don’t leave it up to companies to make the right decisions for your health. This entry was posted in Beyond Talkin' Trash, Talkin' Trash. Bookmark the permalink. Ah babies, one of my favourite subjects. Look into baby led weaning. No need to purchase any additional items or equipment. There’s a lovely little baby and kids store on the Danforth called 100 mile child who endeavour to only stock items made within a 100 mile radius of their store. Great article!! More please more!